Should Central America Listen to the WSJ and Copy Hong Kong, or Listen to the OECD and Copy Greece? The great thing about the Economic Freedom of the World is that it’s like the Swiss Army Knife of global policy. No matter where you are or what issue you’re dealing with, EFW will offer insight about how to generate more prosperity. Since today’s focus is Central America, let’s look at the EFW data. As you can see, it’s a mixed bag. Some nations are in the top quartile, such as Costa Rica, Guatemala, and Panama, though none of them get high absolute scores. 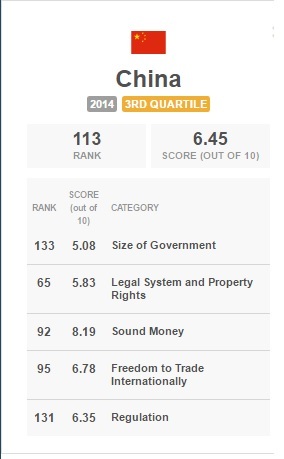 Mexico, by contrast, has a lot of statism and is ranked only #88, which means it is in the third quartile. And Belize is a miserable #122 and stuck in the bottom quartile (where Cuba also would be if that backwards country would be ranked if it produced adequate statistics). 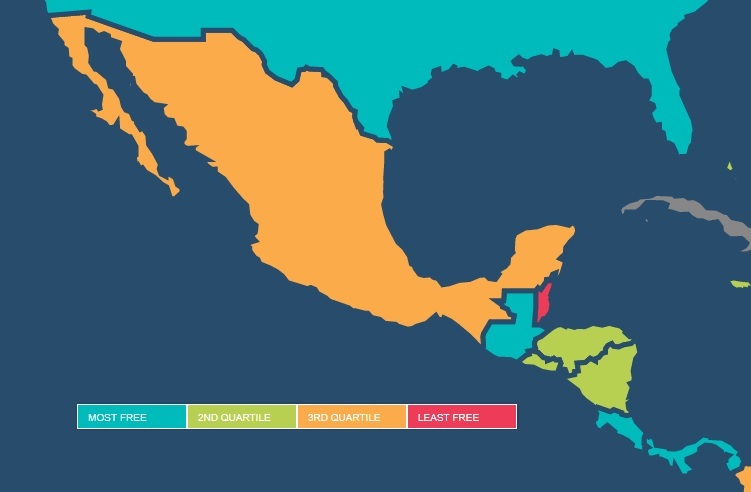 One of the great challenges for development in central America (as well as other parts of the developing world) is figuring out how to get poor and middle-income nations to make the jump to the next level. Mary Anastasia O’Grady of the Wall Street Journal has a column on how to get more growth in Central America. She focuses on Guatemala, but what she writes is applicable for all neighboring countries. She explains that Guatemalan entrepreneurship is hampered by excessive taxation and regulation. Yet Guatemalan eagerness to run a business has not translated into prosperity for the nation… The country ranks a lowly 59th in entrepreneurs’ expectations that they will create six or more jobs in five years. It also sinks to near the bottom of the pack (62nd) in creating business-service companies. …The World Bank’s 2017 “Doing Business” survey provides many clues about why the informal economy is so large. Guatemala ranks 88th out of 190 countries world-wide for ease of running an enterprise, but in key categories that make up the index it performs much worse. The survey finds that it takes 256 hours to comply with the tax code. The total tax take is 35.2% of profits. It takes almost 20 days to start a legal enterprise and costs 24% of per capita income. To enforce a contract it takes more than 1,400 days and costs more than 26% of the claim. The good news is that we know the answers that will generate prosperity. The bad news is that Guatemala gets a lot of bad advice. The obvious solution is an overhaul of the tax, regulatory and legal systems in order to increase economic freedom. A lower tax rate and a simpler code would give companies an incentive to operate legally, thereby broadening the base and improving access to credit. Instead the Guatemalan authorities—encouraged by the State Department and the International Monetary Fund—spend their resources trying to impose a complex, costly system in an economy of mostly informal businesses with a much-smaller number of legal, productive entrepreneurs. Recently the United Nations International Commission against Impunity in Guatemala recommended a new tax to fight “impunity.” This is no way to attract capital or raise revenue. Speaking of bad advice, let’s now contrast the sensible recommendations of Ms. O’Grady to the knee-jerk statism of the Organization for Economic Cooperation and Development. In a new report on Costa Rica’s tax system, the OECD urged ever-higher fiscal burdens for the country. Including destructive class warfare. Costa Rica’s tax revenues are…insufficient to finance the country’s current spending needs. …In addition to raising more tax revenue…, Costa Rica needs to…enhance the redistributive role of its tax system. …the role of the personal income tax (PIT) should be strengthened as it currently raises little revenue and does not contribute to reducing inequality. …Collecting greater revenues from the PIT, by lowering the income threshold above which PIT has to be paid as well as by introducing additional PIT brackets and gradually raising the top PIT rate, could contribute to reducing income inequality. But the OECD doesn’t merely want to hurt successful taxpayers. The bureaucracy is proposing other taxes that target everyone in the country. Including a pernicious value-added tax. Costa Rica does not have a modern VAT system in place. …Costa Rica’s priority should be to introduce a well-designed and broad-based VAT system…to be able to generate additional revenues… There is scope to improve the environmental effectiveness of tax policy while also increasing revenue. 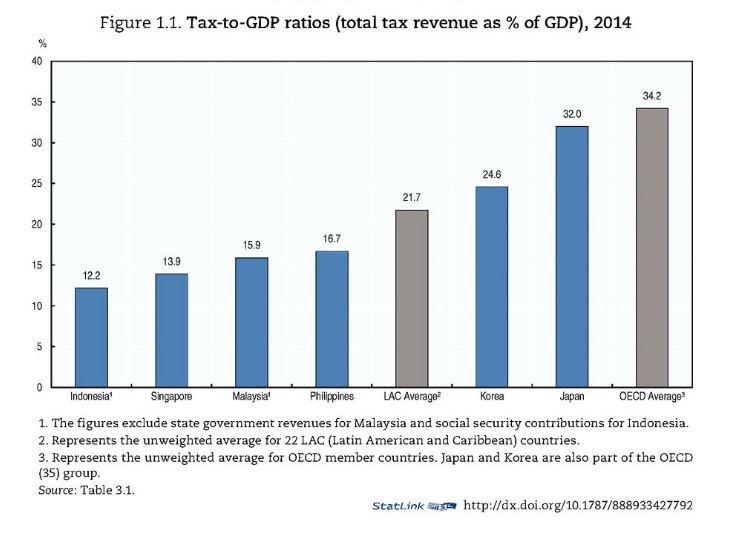 So why is the OECD so dogmatically in favor of higher taxes in Costa Rica? Are revenues less than 5 percent of GDP, indicating that the country is unable to finance genuine public goods such as rule of law? Is the government so starved of revenue that Costa Rico can’t replicate the formula – a public sector consuming about 10 percent of economic output – that enabled the western world to become rich? Of course not. The report openly acknowledges that the Costa Rican tax system already consumes more than 23 percent of GDP. The obvious conclusion if that the burden of government in Costa Rica should be downsized. And that’s true whether you think that the growth-maximizing size of government, based on the experience of the western world, is 5 percent-10 percent of GDP. Or whether you limit yourself to modern data and think the growth-maximizing size of government, based on Hong Kong and Singapore, is 15 percent-20 percent of economic output. Here’s another amazing part of the report, as in amazingly bad and clueless. The OECD actually admits that rising levels of government debt are the result of spending increases. …significant increases in expenditures have not been matched by increases in tax revenues. …Between 2008 and 2013, overall government spending increased as a result of higher public sector remuneration as well as higher government transfers to finance public sector social programmes. What’s particularly discouraging, as you just read, is that the higher spending wasn’t even in areas, such as infrastructure, where there might arguably be a potential for some long-run economic benefit. Instead, the government has been squandering money on bureaucrat compensation and the welfare state. Here’s another remarkable admission in the OECD report. The high tax burden is a key driver of the informal economy in Costa Rica. The IMF estimated the size of the informal economy in Costa Rica at approximately 42% of GDP in the early 2000s… Past work from the IMF showed that rigidities in the labor market and the high tax burden were the most important drivers of informality. Yet does the OECD reach the logical conclusion that Costa Rica needs deregulation and lower tax rates? Of course not. The Paris-based bureaucrats instead want measures to somehow force workers into the tax net. Bringing more taxpayers within the formal economy should be a key priority. …the tax burden in Costa Rica is borne by a small number of taxpayers. This puts a limit on the amount of tax revenue that can be raised…and puts a limit to the impact of the tax system in reducing inequality. Ironically, the OECD report actually includes a table showing why the IMF is right in this instance. As you can see, social insurance taxes create an enormous wedge between what it costs to employ a worker and how much after-tax income a worker receives. In other words, the large size of the underground economy is a predictable consequence of high tax rates. Let’s conclude with the sad observation that the OECD’s bad advice for Costa Rica is not an anomaly. International bureaucracies are routinely urging higher tax burdens. Indeed, I joked a few years ago in El Salvador that the nation’s air force should shoot down any planes with IMF bureaucrats in order to protect the country from bad economic advice. If there was a ranking of international bureaucracies, the World Bank would be my favorite (or, to be more accurate, least unfavorite). Yes, it sometimes produces bad studies, but it also is the source of good research on topics such as government spending, Social Security reform, tax complexity, financial regulation, and economic liberty. And the rankings in Doing Business are a very helpful way of measuring and comparing regulatory burdens (which is why leftists are so hostile to the project). Moreover, it’s hard to dislike an organization that has a mission of fighting poverty (even if it sometimes thinks redistribution is the right strategy). The United Nations would be next on the list. The good news is that it has many well-meaning people. The bad news is that is has some very misguided projects. But since it isn’t very effective, I confess that it doesn’t command much of my attention. At the bottom would be either the International Monetary Fund (IMF) or the Organization for Economic Cooperation and Development (OECD). 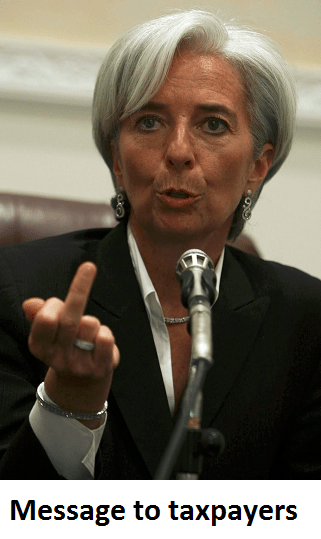 The IMF is notorious for supporting bailouts and advocating tax increases. Depending on my mood, it’s either the “Dr. Kevorkian of economic policy” or the “dumpster fire of the global economy.” Yes, I try to be fair and will acknowledge occasional good research (on taxation, government spending, financial regulation, spending caps, etc), but there’s no question that the net impact of the IMF is negative. The OECD also is on the wrong side when looking at the big picture. Once again, I’ll admit that there are occasional good studies (on spending caps, tax policy, government spending, etc). But those glimmers of good news are overwhelmed by a statist agenda on a wide range of policies. Most recently, the Paris-based bureaucracy proposed more taxes and more spending for the American economy. And if you’re interested in other examples, I’ve attached a list of examples at the bottom of this column. But the main purpose of this column is to review a new publication from the OECD. As part of its so-called “Bridging the Gap” project, the bureaucrats in Paris just issued a new report that reads as if it was taken from the campaign speeches of Bernie Sanders and Jeremy Corbyn. Here are some of the lowlights, starting with a misguided fixation on inequality. I’m tempted to joke that the bureaucrats want a “distribute first, grow never” approach, but let’s focus on the fact that the real goal should be reducing poverty rather than reducing inequality. If I’m poor, I want an opportunity to increase my income. And if there’s a policy that will help give me that opportunity, it doesn’t matter if that policy enables Bill Gates to increase his income at a faster rate. That’s why there’s no substitute for economic growth if you really want to help the less fortunate. But the not-so-subtle message of the OECD report is that poor people are poor because rich people are rich. The bureaucrats are concerned with how to re-slice the pie rather than how to expand the size of the pie. The really troubling material is in the final chapter, but I can’t resist commenting on a few items that appeared earlier in the report. Such as the fact that the bureaucrats were not happy when unemployment benefits in the United States were curtailed. …redistribution helped cushion increases in market income inequality, but its role has since tended to fall in a majority of OECD countries in the most recent years…it reflects the phasing out of fiscal stimulus, as in the United States, where the extension of unemployment benefit duration carried out in 2008-09 was rolled back in 2011. Too bad nobody told the authors that the job market improved in America when subsidies for joblessness were cut back. But that kind of mistake is predictable since the OECD puts such a high value on coercive redistribution. I’m also not surprised that the bureaucrats are upset that tax competition has resulted in lower tax rates. Globalisation has increased the difficulty for governments in taxing mobile capital income. Increased levels of capital mobility have led to certain reductions in statutory income tax rates…, which has reduced the progressivity of tax systems… The distributional effects of these reductions in statutory tax rates, especially the reduction in top personal income tax rates, has been a contributing factor to the rise in inequalities. And the OECD even regurgitated its bizarre hypothesis that inequality reduces growth. Widespread increases in income inequality are a source of concern…for their potential impact on economic performance. …recent OECD work estimates that rising inequality between 1985 and 2005 might have contributed to knocking more than 4 percentage points off growth between 1990-2010. Governments have a vital role to play…targeted social investment, redistributive fiscal policy and comprehensive labour market support…fiscal policy is the key mechanism for redistributing market incomes and it is important that it is set up to prioritise support for vulnerable population groups at all points in the economic cycle. And what are some of these policies? The OECD wants to expand the welfare state, even though such policies already have caused fiscal crises in many nations. The size of means-tested programmes is relatively small in many countries and there is room for expansion, by either making those programmes more generous or by extending their coverage. The bureaucrats also want more double taxation on income that is saved and invested. …enhancing tax progressivity via savings tax reform. Income from savings is taxed progressively, though at lower rates than labour and with a lot of variation in taxation across asset types. …There is therefore scope to increase the fairness and the neutrality of the taxation of capital income…removing tax expenditures…strengthening progressivity of tax bases. …tax expenditures such as tax deductions for private pension contributions…are regressive since higher income taxpayers tend to save… Removing such tax expenditures could simultaneously reduce inequality and make the tax system more efficient. There’s also an embrace of punitive property taxes. Increased taxation of residential property could increase both growth and strengthen progressivity. …if designed well can fall mostly on high-wealth, high-income households. Amazingly, the OECD even wants more onerous death taxes, even though such policies have a very negative impact on capital formation. Strengthening inheritance and gift taxes can support inclusive growth. … Inheritance taxes can…help achieve intergenerational equity goals. …In order to be effective, inheritance taxes must also be combined with taxes on gifts and wealth transfers during the taxpayers’ lifetime, as well as with measures to address avoidance and evasion. The bureaucrats want more subsidies for joblessness. Sufficiently generous unemployment benefits and social-assistance systems with a wide coverage are also a key. And they even endorse an idea that is so economically absurd that it was rejected by President Obama’s main economic adviser. Promoting gender equality in access to employment and job quality is a key component of inclusive growth. …gender pay gaps remaining at about 15% across the OECD, on average, with little change in recent years. Here’s another passage urging a bigger welfare state. Compensatory policies that redistribute income also have a role to play in…lowering post-redistribution inequality. …strong and well-designed social safety nets programmes are all the more needed. And here’s a specific policy for more housing subsidies. Access to affordable housing is a challenge for inclusion, and solutions include not only better housing policies but also better urban planning and governance of land use. …Explicit policies to support access to housing include housing allowances, social housing arrangements and different kinds of financial support towards homeownership. 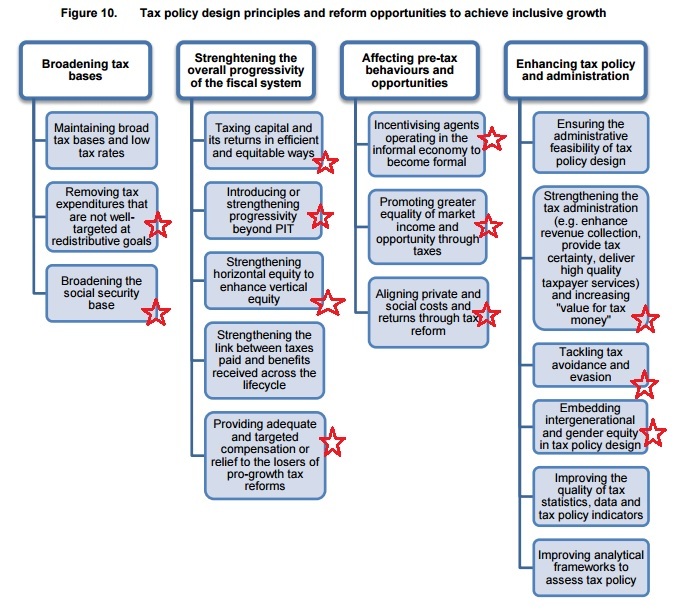 As you can see, that’s an impressive collection of statist policies, even for the OECD. P.S. I wrote last year that some folks on the left enjoy very lavish incomes while crusading about inequality. The same is true of the OECD, where bureaucrats not only are lavishly compensated (a general rule for international organizations), but they also enjoy tax-free incomes while urging higher taxes on the rest of us. P.P.S. Here are additional examples of very dodgy research from the OECD. The OECD allied itself with the nutjobs from the so-called Occupy movement to push for bigger government and higher taxes in the United States. It even concocted dishonest poverty numbers to advocate more redistribution in the United States. The bureaucrats endorsed a big energy tax on American consumers. The OECD embraced quota-driven interventionism on wages for men and women. Last year, it called for more Keynesian spending (on more than one occasion). P.P.P.S. Don’t forget that the OECD’s statist agenda is financed by your tax dollars. I wrote yesterday about how the Organization for Economic Cooperation and Development (OECD) is pushing for bigger government in China. That’s a remarkable bit of economic malpractice by the Paris-based international bureaucracy, especially since China is only ranked #113 in the latest scorecard from Economic Freedom of the World. The country very much needs smaller government to become rich, yet the OECD is preaching more statism. But nobody should be surprised. The OECD, perhaps because its membership is dominated by European welfare states, has a dismal track record of reflexive support for bigger government. It supports higher taxes and bigger government in Asia, in Latin America, and…yes, you guessed correctly…the United States. And here’s the latest example. In a new publication, OECD bureaucrats recommend policy changes that ostensibly will produce more growth for the United States. Basically, America should become more like France. Income inequality has continued to widen… Public infrastructure is not keeping pace… Promote mass transit… Implement usage fees based on distance travelled…to help fund transportation… Expand federal programmes designed to improve access to fixed broadband. …Expand funding for reskilling… Require paid parental leave… Expand the Earned Income Tax Credit and raise the minimum wage. To be fair, not every recommendation involves bigger government. But even that single concession to good policy is matched by proposals to squeeze more money from the private sector. …and broaden the tax base. …Continue with measures to prevent base erosion and profit shifting. By the way, even though European nations dominate the OECD’s membership, American taxpayers provide the largest share of funding for the OECD. In other words, we’re paying more taxes to have a bunch of international bureaucrats urge that we get hit with even higher taxes. And to add insult to injury, OECD bureaucrats are exempt from paying taxes! Maybe that’s why they’re so blind to the harmful impact of bad tax policy. It’s especially discouraging that the bureaucrats are even advocating greater levels of discriminatory taxation of saving and investment. Here are some blurbs from a report in the Wall Street Journal. The Paris-based think tank has just junked the conventional economic wisdom on tax it had been promoting for years. …“For the past 30 years we’ve been saying don’t try to tax capital more because you’ll lose it, you’ll lose investment. Well this argument is dead…,” Pascal Saint-Amans, the OECD’s tax chief, said in an interview. …Since the 1970s economists had argued capital income should be taxed relatively lightly because it was more mobile across countries and attracting investment would boost economic growth, ultimately benefiting everyone. Actually, the argument on not over-taxing capital income is based on the merits of a neutral tax system that doesn’t undermine growth by punishing saving and investment. The fact that capital is “mobile across countries” was something that constrained politicians from imposing bad tax policy. In other words, tax competition promoted better (or less worse) policy. But now that tax havens and tax competition have been weakened, politicians are pushing tax rates higher. And the OECD is cheering this destructive development. Here are some passages from the OECD report on this topic. …there have been calls to move away from a narrow focus on economic growth towards a greater emphasis on inclusiveness. …Inclusive economic growth…implies that the benefits of increased prosperity and productivity are shared more evenly between people… More specifically with regard to tax policy, inclusive economic growth is related to managing tradeoffs between equity and efficiency. Growth-enhancing tax reforms might come at certain costs in terms of meeting equity goals so tax design for inclusive growth requires taking into account the distributional implications of tax policies. In other words, the OECD wants to shift away from policies that lead to a growing economic pie and instead fixate on how to re-slice and redistribute a stagnant pie. And here’s a flowchart from the OECD report. Keep in mind that “inclusive growth” actually means less growth. I’ve helpfully put red stars next to the items that involve more transfers of money from the productive sector of the economy to the government. That flowchart shows what the OECD wants. But if you want a real-world example, just look at Greece, France, and Italy. Which brings me to my final point. To be blunt, it’s crazy that American taxpayers are subsidizing a left-wing overseas bureaucracy like the OECD. If Republicans have any brains and integrity (I realize that’s asking a lot), they should immediately pull the plug on subsidies for the Paris-based bureaucracy. Sure, it’s only about $100 million per year, but – on a per-dollar spent basis – it’s probably the most destructive spending in the entire budget. P.S. 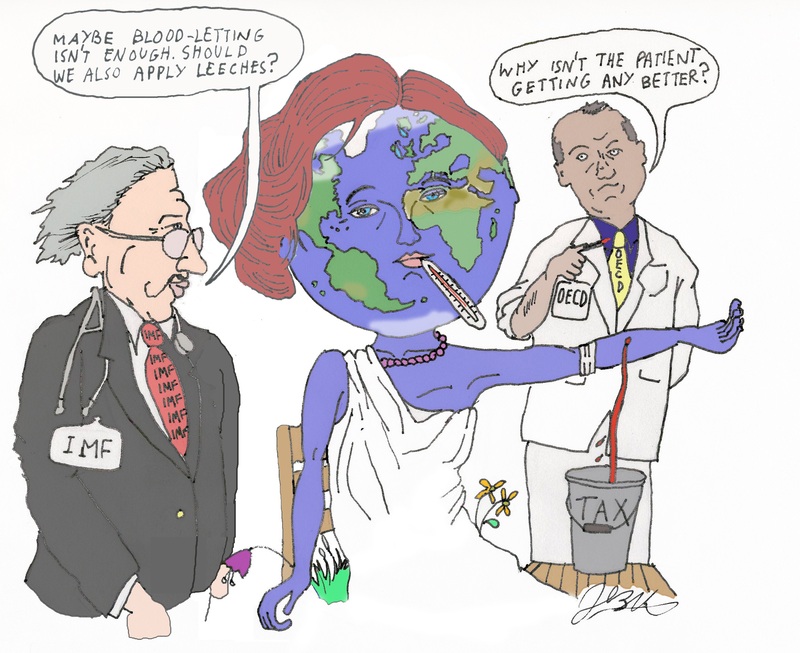 The OECD even wants a type of World Tax Organization.